AMHERST, Mass. – Microbiologist Kristen DeAngelis at the University of Massachusetts Amherst recently was awarded two grants totaling about $2.5 million from the U.S. Department of Energy (DOE) to advance understanding of the role of soil microbes in feeding carbon into the atmosphere and contributing to global warming. Soils are the largest repository of organic carbon in the terrestrial biosphere and represent an important source of carbon dioxide (CO2) to the atmosphere, DeAngelis says. "Our results could lead to new ideas for curbing the effects of climate change, and one of the implications of this research could be remediating soil to improve its ability to store carbon." The first grant, a three-year, $1.9 million study on microbial feedbacks to climate in a warming world, is from the DOE Genomic Sciences program, to investigate microbial control over soil carbon dynamics using genomics and other "omics," stable isotope and modeling approaches. The second, a two-year, $600,000 study is from DOE's Terrestrial Ecosystem Sciences (TES) program and is designed to resolve conflicting physical and biochemical feedbacks to climate in response to long-term warming. Soils perform an important ecosystem service by storing carbon, preventing its release as greenhouse gases into the atmosphere. DeAngelis, a microbial ecologist, says both projects will focus on research plots at Harvard Forest, a research station in Petersham, Mass., to address the question of how climate change affects soil carbon, and both will examine carbon-use efficiency (CUE) as a possible source of climate-altered feedbacks to warming. CUE refers to the difference between carbon assimilated into microbial products versus carbon lost to the atmosphere as CO2, creating a positive feedback to climate. 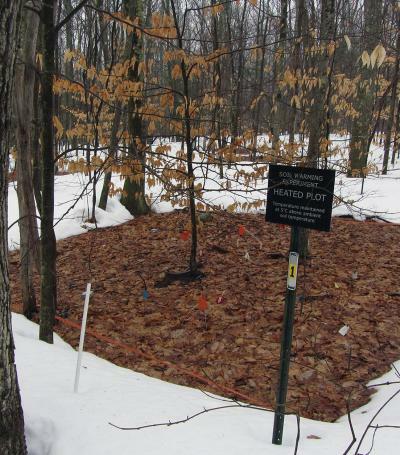 The studies take advantage of long-term soil-warming experiments already in place at the research forest, where heating coils similar to those used to keep football and soccer fields from freezing are buried about 4 inches (10 cm) deep in several plots. They keep the soil surface exactly 5 degrees Celsius warmer than the ambient temperature, creating an outdoor laboratory of artificial climate change. The three patches have been kept warm for as long as 25 years, with research suggesting that long-term trends are not linear. DeAngelis says the genomics work supports research on bacteria and fungi that have endured over two decades of warming and a control set which has not to test the hypothesis that she and colleagues can define genes that predict terrestrial CUE. This award includes the study of a culture collection of over 500 bacterial isolates at UMass Amherst from the warming study, representing eight phyla and 32 classes of diversity, as well as a culture collection of over 200 fungal isolates under direction of Serita Frey at the University of New Hampshire. The researchers will compare bacterial and fungal response in different situations and at different substrate quality, quantity, moisture and temperature levels in heated vs. control conditions, among other things. One goal is to contribute new information to models that estimate how much the planet will warm but which at present do not account in an explicit way for the microbial contributions, a major contribution to global carbon cycling. "We want to improve these techniques by helping them to incorporate microbes in carbon cycle models," DeAngelis says. For the TES study, the researchers will investigate physical and biochemical mechanisms of warming-altered microbial carbon availability in soils, in part by imaging microbes and carbon at Argonne National Laboratory. In addition to DeAngelis, other investigators on the team include Erin Conlon in the mathematics and statistics department at UMass Amherst, Serita Frey and Stuart Grandy of the University of New Hampshire, Jerry Melillo at the Marine Biological Laboratory, Ken Kemner at Argonne National Lab, Bhoopesh Mishra at Illinois Institute of Technology and Seeta Sistla of Hampshire College. DeAngelis says, "This work is highly collaborative. I could not do this work without my colleagues at our partner institutions. The team approach is going to push the field forward, and I think funding agencies are recognizing now that better science happens when people work on diverse, multi-disciplinary teams." She adds, "I think it's a wonderful trend. It means I get to ask bigger questions and I'm not restricted to just the instruments I have in my own lab. Physical chemistry is not my field, but with this new team emphasis, I will learn a new language and we can bridge gaps to answer whole big new questions that a microbiologist might never have dreamed of doing before."